When I visited South Korea last year, I saw firsthand just how much the country valued education. South Korean students have longer school hours than their U.S. peers. Many receive tutoring most days of the week. College libraries in South Korea are littered with touch screens and electronic archives. Since the late 1970's, higher education in South Korea – especially in science and technology fields – has exploded. Although only 5 percent of young adults attended college in 1977, over 80 percent of students attend college today in South Korea. Higher education is not an option – it's an expectation of almost every student. That's why I was surprised and slightly troubled to hear that textbook publishers in South Korea will be removing references to evolution from their high school educational materials. Biologists in South Korea claim that no scientists were consulted before the decision was made, according to Nature News. An offshoot of the Korean Association for Creation Research (KACR) petitioned the South Korean government to remove several examples of evolutionary theory, such as the avian ancestor Archaeopteryx pictured above. Apparently, the government passed this petition to the textbook publishers, leading to many publishers to either significantly revise or forgo all mention of the examples. “The biggest problem is that there are only 5–10 evolutionary scientists in the country who teach the theory of evolution in undergraduate and graduate schools,” Dayk Jang, an evolutionary scientist at Seoul National University, told Nature News. This statement seems a bit dubious: how can there only be a handful of evolutionary scientists teaching this material at universities? Then again, Christian influence has spread widely in South Korea, and that may have had an impact on the teaching of evolution. The reasons behind the publishers' decision, however, remain speculative. As part of my trip last spring, I visited Yonsei University, a private Christian university that is consistently ranked among the top tier universities in South Korea. The university has numerous large research projects and is well-respected internationally. Within South Korea, observers generally rank it in the top three universities in a country where school prestige plays a more important role than in the United States, especially for students' employment options. 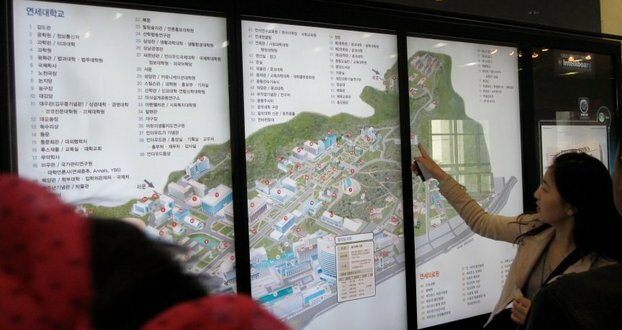 An interactive map on one of Yonsei University's touchscreens. Image Credit: Brian Jacobsmeyer. After touring the university and seeing its impressive facilities and attending lectures by its faculty, it was hard to believe that only a handful of professors cover evolutionary biology at the university level. Although South Korea focuses intently on science and engineering education, maybe they've been devoting resources much more heavily to other sciences. And if this is true, it seems misguided. Universities, even ones dominated by science and engineering, should maintain diverse curricula. Neglecting individual sciences such as evolutionary biology will likely lead to a workforce with fewer critical thinkers. Top image courtesy H. Raab via Wikimedia Commons.